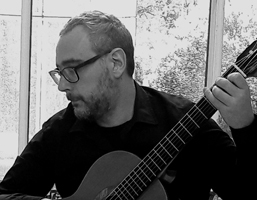 Emiliano Leonardi was born in Arpino, Italy (FR) in 1979 and at the age of 18th begins the study of classical guitar. In 2004 he graduated at the “Santa Cecilia” Conservatory of Rome under the guidance of M° Giuliano Balestra. From 2000 he regularly gives numerous concerts as a soloist, as a chamber musician in various instrumental combinations and playing with orchestra, developing his musical career in Spain, France, Switzerland, Czech Republic, Slovenia, Russia, etc. Winner of several national competitions including “National Competition for Instrumental Execution”, Naples, “European music Competition”, Atri (TE), “Competition of musical performance Teramo Est”, Giulianova (TE), “International Competition of Ortona”, Ortona (CH), National competition “Città di Bacoli”, Naples. He was one of the finalists in the “Concorso Humaniter” that was organized for all students of Italian conservatories in 2003. He has followed different courses of specialization, studying with David Russel, Emanuele Segre, Bruno Battisti D’Amario, Massimo Delle Cese, Eugenio Becherucci and Alfonso Borghese. In 2007 he obtained a diploma in didactic of music at the “Licino Refice” Conservatory of Frosinone and in 2011 he graduated in didactic of instrumental music at the “Luigi Cherubini” Conservatory of Florence. In 2015 he attended the two-year specialist course at the Musical Institute of “Giulio Briccialdi”, Terni. From 2008 to today, being the artistic Director of the festival “Suoni dal Legno”,Todi (PG), hosted also the artists of pop-rock music, such as Jethro Tull, Dream Teather, Steve Hackett (ex Genesis), Tuck ‘n Patty, Gino Paoli, Michele Zarrillo, Franco Cerri. Was the artistic Director of the “Todi Festival” in the seasons 2011 – 2012. From 2016 plays in duo “LL” with the guitarist Sandro Lazzeri and parallel teaches the instrument in the middle school.